The Finishing Touch can respond very quickly when the circumstances demand a fast turnaround. Take their latest project in Tiffany Grove, Templestowe for the supply of eave mouldings. The exterior mouldings are 300mm x 300mm x 2.3 metres long, and will be installed all round the 50 square, one storey home. The order was received only a week ago and they are busy manufacturing the decorative mouldings right now. The house mouldings will be installed this week. The Finishing Touch usually take only two to four weeks for manufacture and installation, but in special circumstances they can speed up their process and deliver even faster. The French Provincial style is very popular in modern Australian housing. This style was first discovered by soldiers in France during the First World War and exported to the United States. 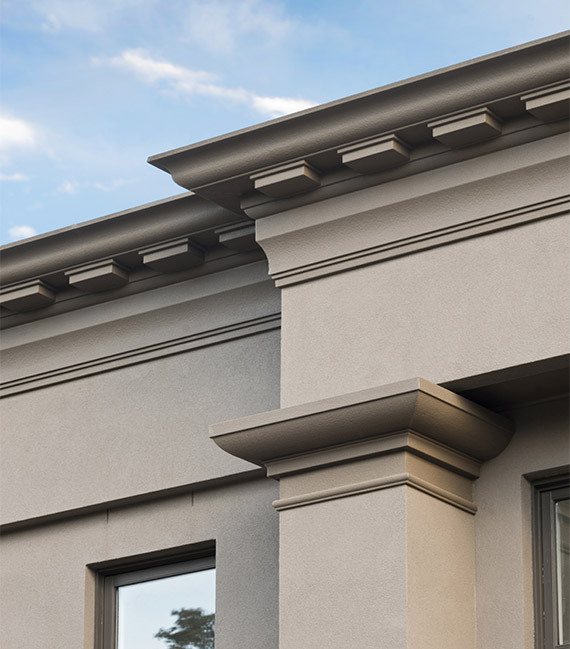 A house In Ballantyne Street, Thornbury will be styled after the French Provincial look, with the Finishing Touch supplying the parapet mouldings. The 84 metres of parapets, 200mm x 155mm x 3mm in size, are currently being manufactured and will be installed by the end of June. A project currently under development is for a substantial home on a rural block in Broadgully Road, Diamond Creek. It involves the manufacture of thirty five flat band mouldings of 2.4 metres. The Finishing Touch’s clients have the certainty that the lightweight mouldings they manufacture will last and their clients can be assured of a quality finish that will remain fresh looking and untarnished for years to come. Offering a warranty of seven years when installed by Finishing Touch certified installers, the Finishing Touch provide high quality decorative mouldings that add class and style. Supplying high grade polystyrene (V.H. grade) for concrete formwork is a slightly different use for lightweight mouldings. The mouldings were used to create concrete formwork for unusual shapes on a CBD city building project by L.U. Simon, using sub-contractors Roman Precast. The Finishing Touch are experts in the development of lightweight mouldings and were called upon to supply to this high level project. Another project they are currently working on is for a postmodern home in Sandy Street, Nunawading. They are supplying window mouldings for all the windows, the decorative mouldings are flat band architraves and flat windowsills. These exterior mouldings will be manufactured and installed in about two month’s time. A two storey house of approximately sixty squares in Jubilee Street, Mount Waverley is another postmodern design for which the Finishing Touch will be supplying decorative mouldings. The architraves and window sill mouldings will be for all the windows around the house, on the upper and lower storeys. A narrow stinger exterior moulding will be installed across the porch. The components are now being manufactured in the factory and will be installed by the end of the month. A large fifty to sixty squares house, designed in the French Provincial style, at 38 Nicholson Street, North Balwyn is using quoinings supplied by the Finishing Touch. These will be completed and installed on the lower level of the house by the end of the month. All customers that use the Manufacturers of the Finishing Touch range, Advanced Mould’s accredited installers will enjoy a seven year warranty on the mouldings and fixing. 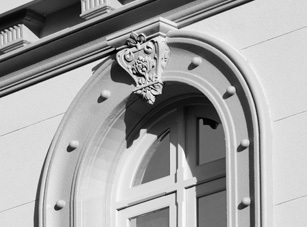 Decorative mouldings have long been used to add an extra element of beauty and decoration to a home or building. Now with lightweight mouldings available it is even easier to use house mouldings to add charm and class due to the easy construction compared to the traditional concrete mouldings. The application of the mouldings is very quick and efficient and the manufacture will only take 2-4 weeks with the Finishing Touch. 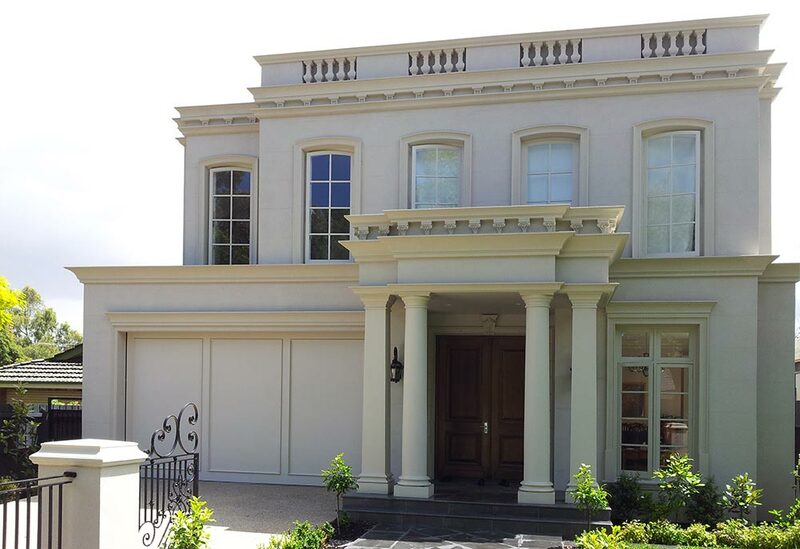 They offer a large range of quality lightweight mouldings, developed by Advanced Moulds which are in high demand for new builds and renovations. One of their latest projects is a new build at Taylors Lakes in Robertson Way. The double storey 72 square home has been designed in a modern, contemporary style. The Finishing Touch are providing decorative mouldings for the eaves, stringers, window sills and window architraves.